Dunk tanks booth water cage rentals in the Atlanta Georgia area. Dunk the boss! Dunk the teacher! The recent movie release "Neighbors 2" featured our rental dunk tanks! Our 350 Gallon tanks now have windows too! Dunk Tanks are fun for every generation. 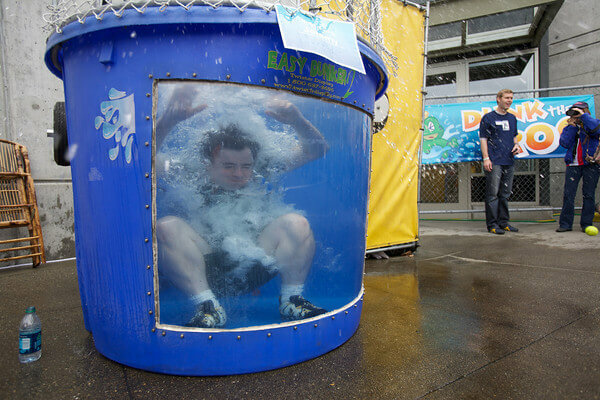 We offer 350 and 500 gallon dunk tank rentals to make you scream with joy as they dunk their "favorite" person. The victim is just sitting there waiting to be dunked as they launch the ball at the target. A hit and a splash or a miss and a boo! People love traditional dunk tanks and we offer two different sizes and even a spray version called the Water Cage Challenge. A dunk tank rental is a tank of fun. Great for fundraising. We do not supply the water. The dunk tanks are available for delivery. We only allow the 350 gallon dunk tank to be picked up by customers. We need to fill up the dunk tanks with water at the site. They do not have water in them when we deliver.